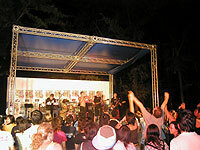 The 2006 May Jam, Tainan's annual free-admission beachside music festival, will be held on Saturday, May 6 and Sunday, May 7. Organized as always by Axel Schunn--a German who has lived in the Tainan area since the early 1990s--the event will again be held at Choumaoyuan, a wooded coastal area near the old harbor of Anping. Axel promises just as much fun and just as many bands as last year (when 56 performed in the Jam and various pre-Jam warm-up shows around South Taiwan). He also promises better toilet facilities, a drama performance, and a children's singing performance by students from the Ananda Marga Sakar School in Tainan County. Naturally, Axel's own band, Charlie Swiggs, will be playing. The current line-up has Axel on guitar and vocals, longstanding bass player A-Bau, and newcomer Ming-ken on drums. Years ago, when he was a junior high school student, Ming-ken saw Charlie Swiggs performing. He bought their CD, and eventually morphed from fan to band member. 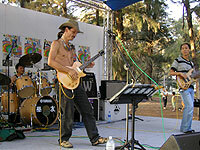 Bands interested in performing should visit the May Jam website (http://www2.eecs.stut.edu.tw/~charlie/) and register by mail. According to Axel, every band that registers in time has "a very good chance" of being given a 40-minute slot to show off their tunes. The website also has a map for drivers. If you don't have a vehicle, take City Bus No. 2 from the train station. This will take you right to Choumaoyuan for just NT$18, though you might have to wait half-an-hour for the bus. 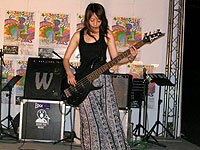 If the weather is bad, the Jam will be postponed to May 13 and 14. In addition to the music, there'll be snack and beverage vendors, and Kaohsiung-based Dead Love Records will have a stall selling their CDs. A good way to support the event, Axel says, is to buy food, drinks, T-shirts, and other items from the organizers' stall. "Our creativity is our most important asset in life," says Axel. "This creativity should be nurtured and nourished. 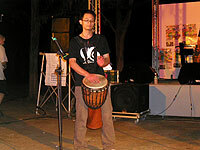 That inspires me to promote original music here in Tainan." Photos provided courtesy of Michael E. (goodsoundz.com).